Below you will find tons and tons of fun activities for each of the five senses with hands on exploration, songs, books, art projects, and much more. Our senses are the way that we explore the world and understand what is going on around us. Teaching your kids about their senses is very important. Activities that stimulate the senses help the brain to develop and function at its peak. Teaching the kids about the five senses (sight, smell, sound, taste, touch) is a good way to help them understand their bodies. A lesson in the five senses is also great for self esteem because they are discovering new and exciting things about themselves. Exploring the senses is also great for kids with autism. Adults can even have fun and might learn something new about what the senses can do. The following activities will help kids understand what each of their senses does for them and how we use the senses in everyday life. As you talk about the five senses with your kids, point out that not everyone has all of the senses. There are some people with differing abilities who might not be able to see or hear or even smell or taste. You will also discover that many activities incorporate more than one of the senses. Multisensory activities are a good thing. Getting all of the senses involved in learning is the ideal to make well rounded, intelligent children. To introduce the theme of the five senses, take the kids on a sensory stroll. Walk around outside and have the kids examine the world using their senses. Ask them what they see. Have them describe what they hear. What kinds of smells are in the air? Let them feel the grass and trees and anything else you encounter in the walk. Find something or bring something for them to taste during the walk. Eat fruit you find or have a picnic outside. Then make a book about the walk you took. Collect samples of what you found and put them in the book. This will help the kids to remember the ways they use their senses. Stations don't have to be complicated. It can be as simple as a container for each sense. 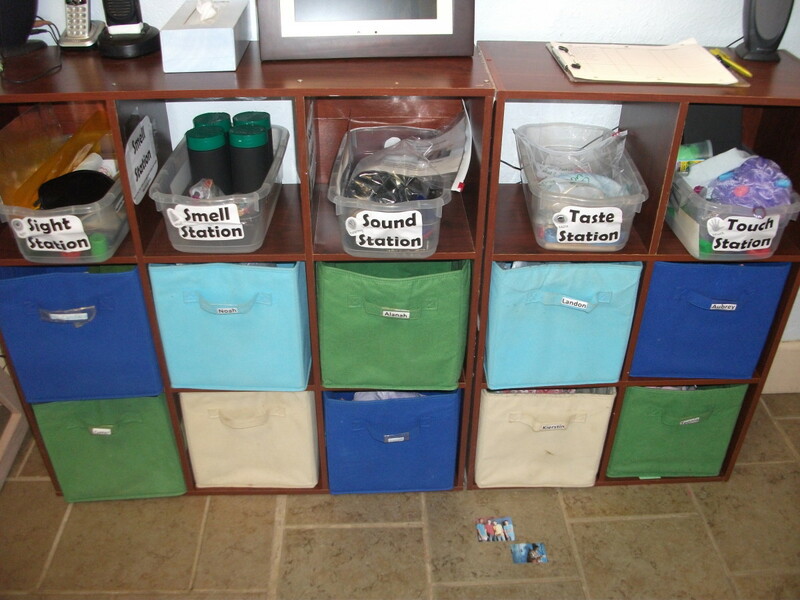 Putting together a station for each of the senses is a good way for kids to learn about what the senses do. The kids can play with the items in the station while exploring their senses. The stations don’t have to be elaborate to be effective. A container for each of the senses is fine. If you are low on space, you could even use one container and put items for all of the senses in it. If you want to do something more elaborate, you can set up dramatic play centers such as an eye doctor’s office with an eye chart, a perfumery with different perfume samples, a candy shop with samples, a sound effects studio with various instruments, and a park with animals and other natural objects to touch. The centers can be nearly anything because we use our senses in so many aspects of life. You can also let the kids experience what it is like to be without a sense. Teach them some people have disabilities and can’t see or hear. There are even some people who don’t have the sensation of touch. The sense of sight is one of the easier senses about which to teach. Most of us depend on our eyesight more than the other senses. Explain to the kids that our eyes are the part of our body that we use to see. Our eyes see the light and then send a message to our brains about what they see. If your kids are older, you can go into more detail about how the eye works. Let the kids experience what it would be like to be blind. Either blindfold them or tie a bandana around their eyes. Have them try to walk around without being able to see. Be sure to monitor them so they don’t crash into something. You can also have the kids try to do something simple while blindfolded. Something like building a tower of blocks or washing hands without sight can be difficult. 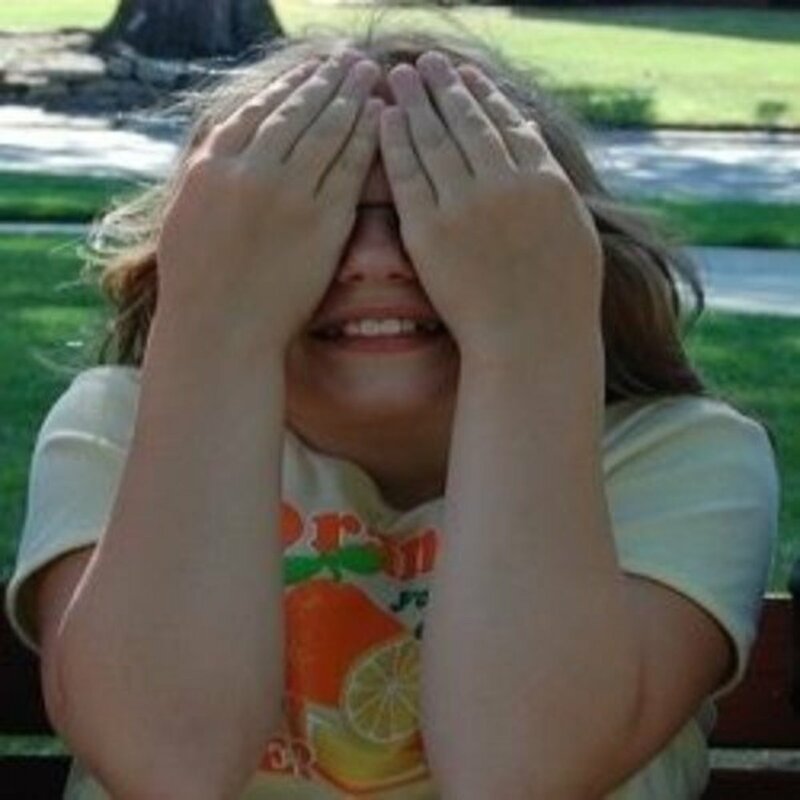 Another blindfolded idea is to have the kids feel someone’s face and try to guess who it is. You can also get a sample of Braille for the kids to feel. Explain that blind people use it to read. 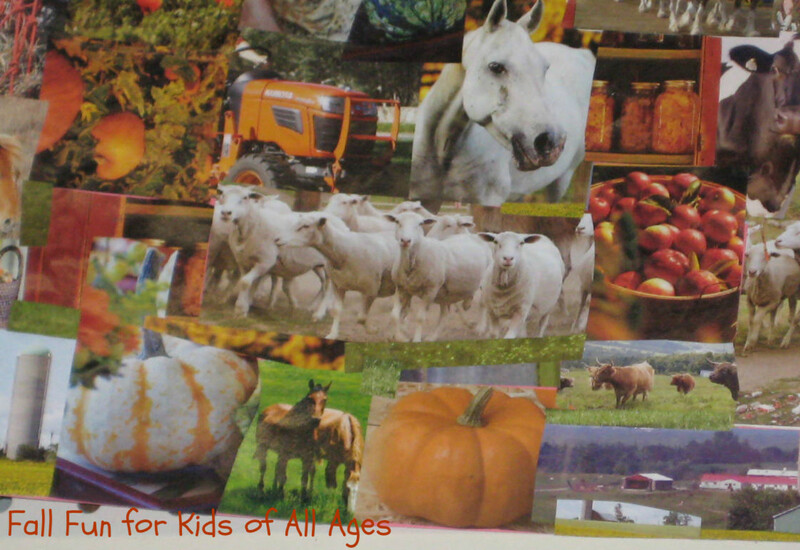 Cut pictures into pieces and the kids must put the pieces back together the right way. 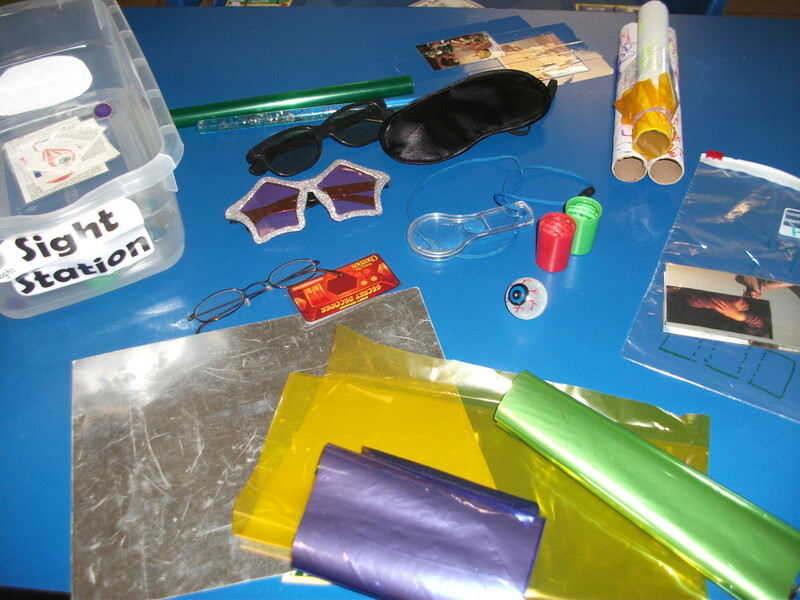 There are plenty of things to do to teach about the sense of sight. It is probably the easiest sense to teach. Matching games are great. The kids must use their eyes to play the game. 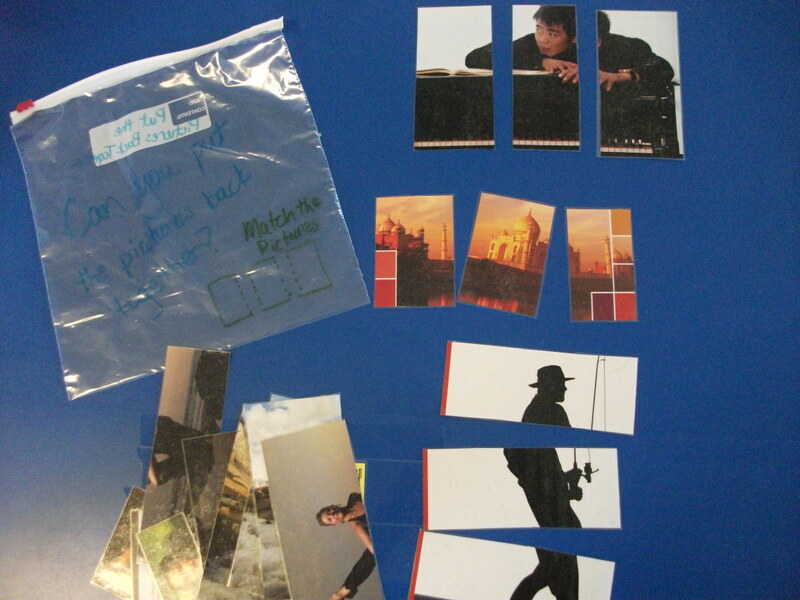 You can make your own matching game using pictures. Just cut the picture into thirds, fourth, or in half. Cut at least three or four pictures. Then the kids try to put the pictures back together the right way. I Spy is another great game. Or play copy cat. One person does something like jumping on one foot and everyone else must watch and then copy it. You can also play traffic light for sense of sight. Make two cards, one with a red light or a stop sign and another with a green light. 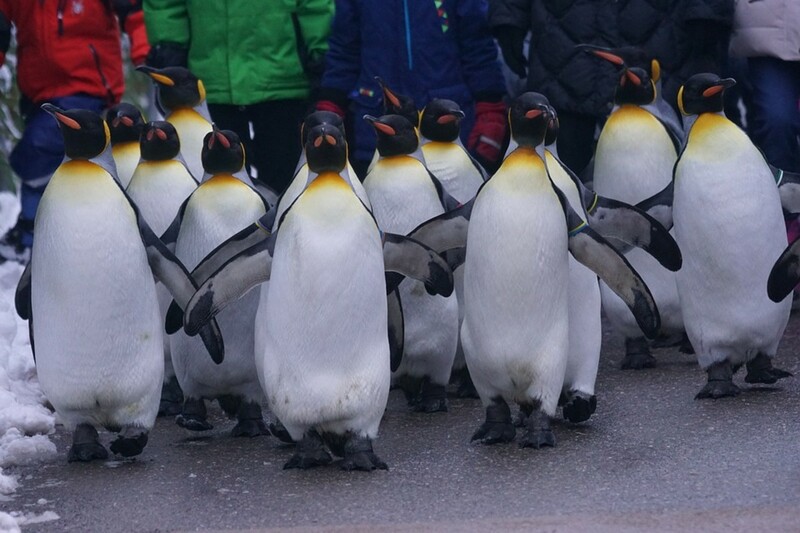 Hold up the green light and have the kids walk around in a circle. They should be watching to see when you hold up the stop light. When you do, they should stop. For math you can demonstrate that you can’t judge volume by the way a container looks. Find several containers of various shapes that hold roughly the same amount. Ask the kids which containers will hold more water. Using a measuring cup, pour the same amount of water into each container. Kids will learn that differently shaped containers can still hold the same amount. Explore colors as a sense of sight activity. Put food coloring in water to make rainbow colors. Let the kids play with the water and mix the colors to make new colors. Discussing rainbows is another good idea. You can also explore shadows. Explain that shadows happen when the light is blocked by an object. Playing with flashlights and mirrors are also good activities for the sense of sight. Art and craft projects for the sense of sight are the easiest. Just about anything you make with art is something visual that you can look at. Think about colors. Let them play around with different colors of paint and mix up their own paint colors. Colored bubbles are fun to use for sense of sight. The bubbles come in multiple shades. You can even do art projects with them. Blow colored bubbles onto a piece of paper. It is a fun and simple project that looks really neat when it is done. Make sure to use the bubbles in the grass or somewhere that a few stains won’t matter. 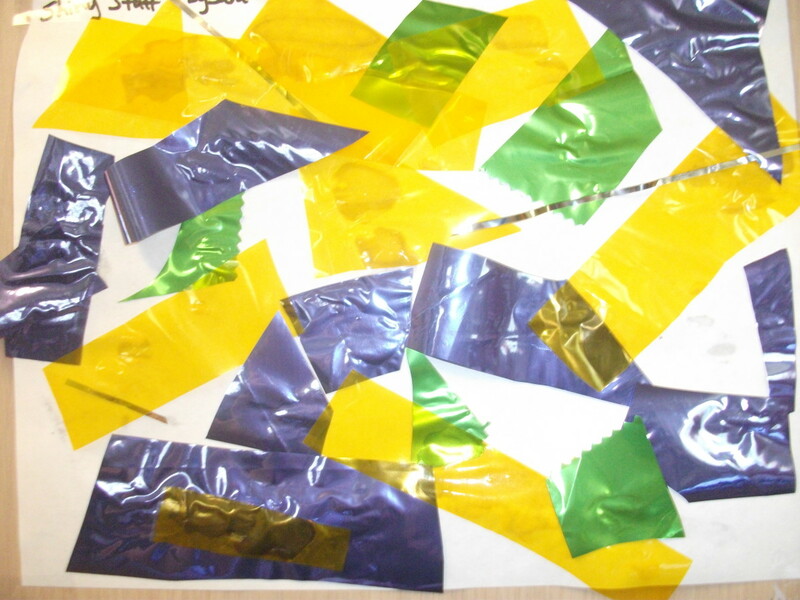 Make a collage with shiny objects like aluminum foil, cellophane, and tinsel. You can even put glitter on it. You can also make a picture with wiggle eyes and make eye masks. Colored cellophane over the eye holes on the mask is a fun effect. Carbon paper is another great thing to use for sight. The kids can draw or write on the top and they will have an identical picture underneath. Invisible ink is a fun project to do as well. Dab a Q-tip into a bowl of lemon juice and write a message with it on a piece of paper. Let the paper dry completely. The message will be invisible. Hold the paper over a light bulb without touching it to the bulb. As the paper heats up, the message will become visible. These are songs about the seeing and eyes. Explore the sense of sight with great things to look at and through. *Kids love to play with color change glasses. Most pairs of color mixing glasses that are sold have big frames. They tend to fall off of the face, but kids still enjoy experimenting with colors and playing with them. The sense of smell is probably the most disregarded senses, but it is more important than most of us realize. Food would taste bland if we couldn’t smell. Think about when you have a stuffy nose. Does the food taste different then? Scent can also can attract us to beautiful things like flowers and repel us from germy things like trash. The sense of smell works when molecules in the air enter our nose. Inside the nose are cilia, which are like hair. The molecule attaches to the cilia and the cilia sends a message to the brain to let the brain know what kind of molecules are in the air. Get some nose plugs or nose clips. Let the kids put them on and try to eat food. Does it taste different? How would being without smell affect other parts of your life? Everyone has a particular scent. Think about how the people you love smell. Scent is linked with memory. So smelling certain things can make you feel happy because you remember somebody important or a special time you experienced. Scents can also be relaxing. That is the goal of aromatherapy. Smell can act as a warning. Smelling smoke can alert you that there is fire. Light a match to demonstrate a burning smell for the kids. What if you couldn’t smell smoke and there was a fire? Scent would be one of the easier senses to give up, but life would be bland without it. 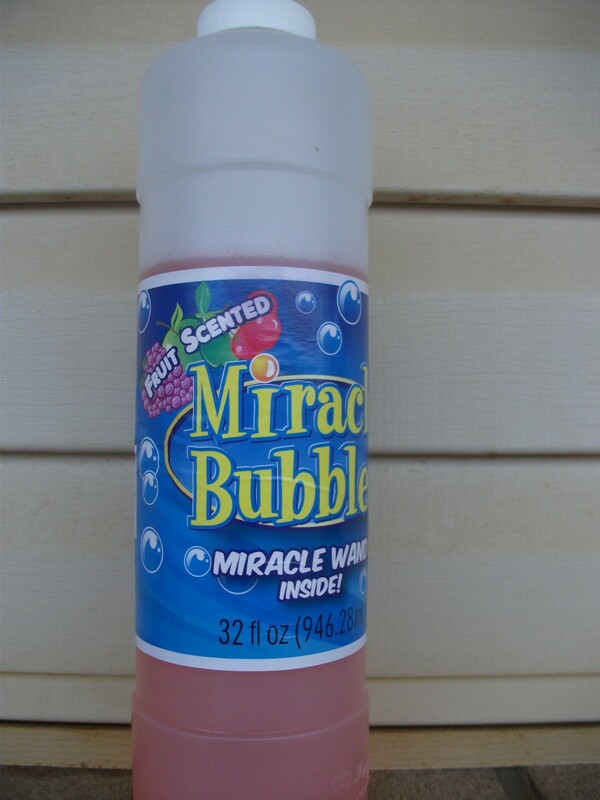 These bubbles have a fruity smell. A good sense of smell activity is to cut out pictures of things that have scents. Let the kids sort the pictures by things that smell good and things that smell bad. Then have them glue the pictures onto a piece of paper divided into the two categories. You can also make a graph of the items that smell bad versus those that smell good. A poll to see who thinks something smells good is also a good math activity. You can also take pictures of the kids’ noses. Let them guess which nose belongs to which person. A variant of this game is to show them pictures of animal noses and let them guess what animal it is. Explain to the kids that many animals have a better sense of smell than humans do. Tell them about dogs that use their nose to sniff our clues and to find certain things. Hide items in the room that have strong scents. Have them use their nose like scent detectives to find the missing items. Blindfold one of the kids and then spray perfume on one or a few kids. The blindfolded child should use his nose to try to figure out where the child who is wearing perfume is located. Bake three or more flavors of cookies. Let the kids choose a cookie based on the way it smells. Did they guess the flavor right using their noses? Spray certain scents in the room periodically. A vanilla flavored scent will work best. Call it “friendship potion.” Tell the kids that now they are under a spell and should act very loving toward one another. You can have another scent for “sweet dreams” or any other time you want to focus their attention. Playing with scented bubbles is a fun activity. You can even pour scented bubble bath into a water play station. A science project for the sense of smell is to try to make the stinkiest socks possible. Gather an old pair of socks or let each of the kids bring in a sock. Pour stinky smelling stuff onto the sock. Pour vinegar over it or grind garlic into the sock. Roll the sock around in the mud. Let the kids come up with ways to make the socks smell bad. Then put the socks into plastic bags and leave them for several days. What scents caused the socks to smell the worst? Smelling jars can be a wonderful learning experience for kids. It helps develop their senses and learn to use more than just their eyes when solving problems. These activities challenge children to identify smells, sort scents, and match smells. One of the best activities for the sense of smell is to make sniff bottles. These are bottles that have scents in them. 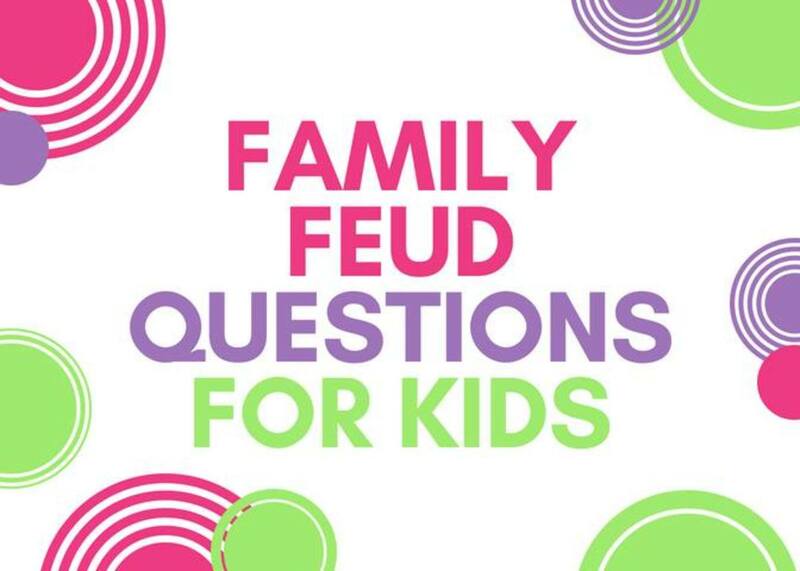 There are many games that can be played with the bottles such as scent matching or the kids can simply guess the scent. Purchase some scented markers and scented stickers. Let the kids create art work with scented materials. You can also purchase scented paper or make your own by spraying it with a scented spray or perfume. Scented ink is easy to make. Simply put a few drops of scented oil onto the ink pad. When the kids stamp with it, it will have a smell. Scented paint is also easy to mix. Put a few drops of fruit extract such as peppermint into the paint. Or you can mix in cinnamon or other types of spices. Adding lemon juice is also another idea. As the kids paint, it will smell. The scent will remain on the paper. Let the kids put together a bag of scented potpourri. The materials are available in craft stores. It makes a nice gift for parents as well. Make scented playdough with Kool-Aid. Mix 5 cups of flour, 1 cup of salt, and 4 packages of Kool-Aid in a large bowl. Bring 4 cups of water to a boil then pour it into the bowl. Add 6 tablespoons of vegetable oil. Mix it together until it is the right consistency. Let the kids play and sniff the playdough. When they are done playing with it, store it in an airtight container. Explore the sense of smell with great things to sniff and smell. Sound is a sense that the children should already understand well. Along with sight, hearing is something that we use most of the day. When objects move, they create vibrations. These are sound waves. The waves are carried to the ears. The ears transform the sound waves into an electrical impulse that is sent to the brain. The brain can then interpret what is heard. There are many deaf people in the world. In addition, many people suffer hearing loss as they get older. Explain that people who can’t hear very well use hearing aids to make the sounds they hear louder. The people who are completely deaf often communicate by reading lips or by using sign language. Teach the kids a few words in sign language. There are many YouTube videos demonstrating how to do sign language. Put ear plugs in the kids’ ears to demonstrate what it would be like if they couldn’t hear well. You could also demonstrate how hearing aids work by using a sound amplification device. Just make sure the items are non-toxic and something the kids won’t put in their mouths. Sanitize the nose plugs after each child wears them. There are several games you can play for the sense of sound. One thing you can have the kids do is to chase around a ball that has a bell in it. The kids could also use brooms or sticks to pass the ball back and forth. Play who has the bell game. Have the kids sit in a circle. Choose one child to be “it.” Have the child close his eyes or blindfold him. Give a bell to another child. 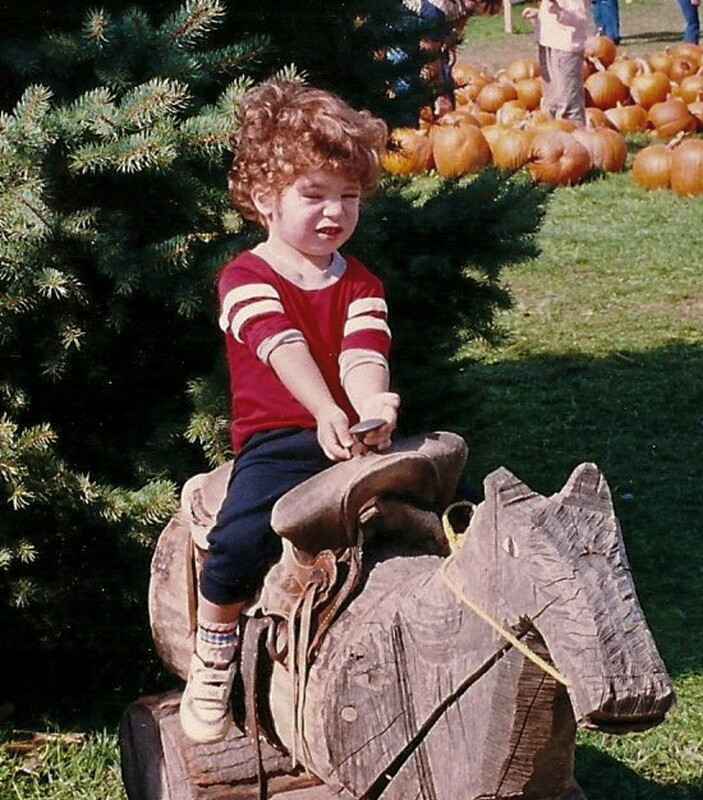 That child rings the bell and then hides it behind his back. The child who is it must guess who has the bell. Let the kids play with a tape recorder. Record each child talking. Play the tapes later and let the kids guess who it is. You can also record cartoon characters speaking and see if the children can guess who the character is. Familiar games like Simon says, musical chairs, and the telephone game are also good games for sound. You can also play guess the musical instrument. Place several instruments or things that make noise behind a barrier so the children can’t see them. Play each instrument and see if the kids can guess what it is. There are CDs with sounds on them. Play those for the kids to see if they can guess the sounds. There are even versions of bingo with sound effects. Have the kids pretend to be robots. The robots must follow directions. Tell the kids the robot code. One beep means move your arm, two beeps means jump, and so on. Make up directions for the robots to follow. Let the kids make music with musical jars. Collect about five jars or glasses. Fill each of the jars with a different amount of water. Using a metal spoon, let the kids tap on the jars to make music. Teach the kids about loud sounds versus soft sounds. Play music very loud and then very soft. Give the kids instruments and have them play loudly and then quietly. Let the kids play with seashells. Show them how to put the seashell to their ears to hear the ocean. Get bubble wrap and cover a section of the floor with it. Let the kids walk on it to make lots of noise. Talking cups are another great project to make. You will need two plastic cups and a long piece of string. Poke holes in the bottom of the cups and thread the string through them. Tie knots in the string so that it won’t fall out of the holes. The cups can be used as telephones for the kids to play with. Serve Rice Krispies for snack. As you pour the milk over the cereal, let the kids listen to the cereal talk to them with snaps, crackles, and pops. Find about 6-10 matching containers. Use about the pairs for younger preschool age kids and more for older kids. Gum and candy containers work as well as film canisters, empty crayon boxes, or small bottles. Either paint the containers or cover them so that they look alike and the kids can’t see what is inside of them. 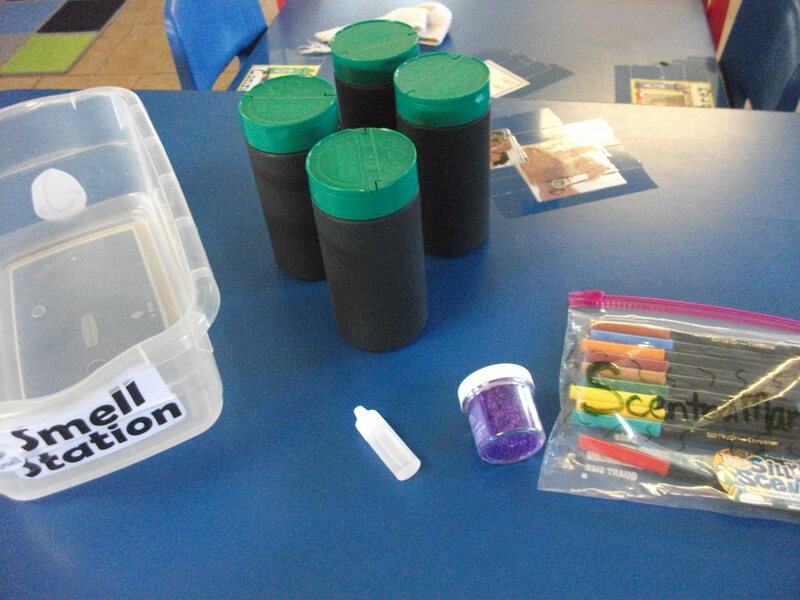 Fill the containers with pairs of items that will make noise when the kids shake them. 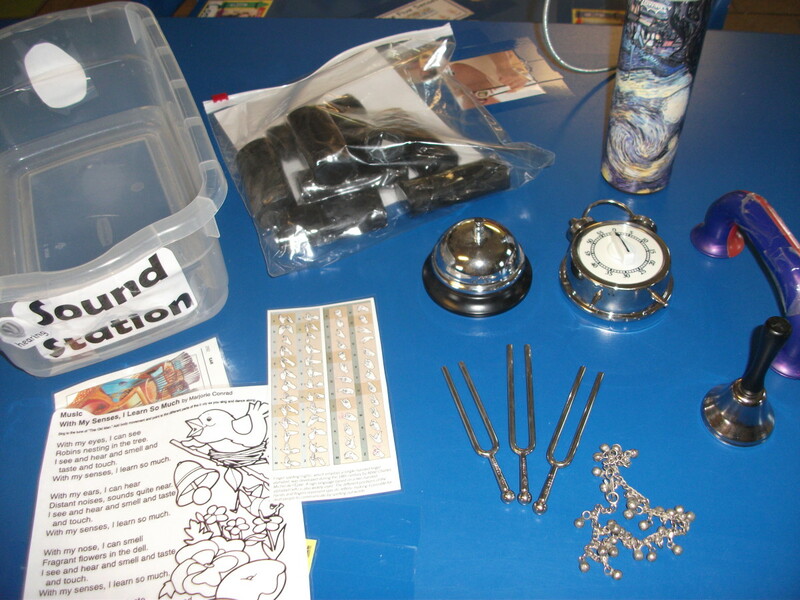 Good items to include are bells, paper clips, rocks, toothpicks, pennies, seeds, or even M&Ms. Seal the containers. You can put colored or numbered indicators on the bottom so the kids can check to see if they have found a match. The kids shake the containers to find the matching pairs of sounds. Check the bottom of the containers to make sure the symbols of each of the pairs match. Any craft that can make noise will be good for the sense of sound. Things like jingle bells or buttons work well. Let the kids put buttons or bells on string to make a necklace or a bracelet. They will have jewelry that jingles. You can make noisemakers using toilet paper rolls. Decorate the outside of the toilet paper roll. Fold one of the ends and tape it off. Put bells or seeds or corn into it so that it will make noise when you shake it. Then seal off the other end. Make rain sticks in the same way. Gather empty toilet paper or paper towel tubes. For longer rain sticks use empty wrapping paper rolls. Color or paint the outside of the tube. Seal one end of the tube by folding it and taping it. Get a piece of aluminum foil that is one and half the length of your tube. Crumple the aluminum foil lengthwise and then coil it into a spring shape by wrapping it around a broom handle. Stick the coil into the tube. Pour in rice and seeds. Close the open end and tape. As the rice and seeds fall down through the coil, it will make the distinctive rain sound. Wind chimes are another great sense of sound craft. You can make them using bamboo sticks, seashells, bells, or anything that will create noise as it bumps together. String the items from a coat hanger or on a hook. When the wind blows, the objects will jingle together. Songs about the ears and hearing. Explore the sense of sound with fun things to create noise. Though everyone (or nearly everyone) has taste buds and can taste similar things like salty, sweet, bitter, foods don’t taste the same to everyone. Taste is probably the most subjective of the senses. When food rubs against the taste buds, it causes the sensation we call taste. The gustatory receptor cell then sends electrical impulses to the brain. The brain interprets the sensations as taste. Imagine eating food that has no taste. People with taste disorders or even smell disorders have distorted taste or no sense of taste at all. This can lead to a loss of appetite, anxiety, and a low quality of life. Most of us enjoy eating and love tasting delicious food. Food poisoning is also more likely because the person cannot taste whether or not something is wrong with the food. Have the kids think about their favorite foods. Then have them imagine what life would be like if they couldn’t taste that food anymore. Using nose plugs or holding the nose and sampling food is a way to simulate being without taste. Blindfold taste test to see if she can guess what food she is eating. The best thing to do for the sense of taste is to have a taste testing party. Set up bite-sized pieces of several foods for the kids to try. Try to find things that have different tastes such as salty, sweet, sour, and bitter. Foods with different textures are also good to serve. Think about crunchy, juicy, soft, dry, wet, hard, and chewy foods. Tea parties are another fun thing to do for taste. Invite the parents to join the class. Serve several flavors of tea for everyone to sample. 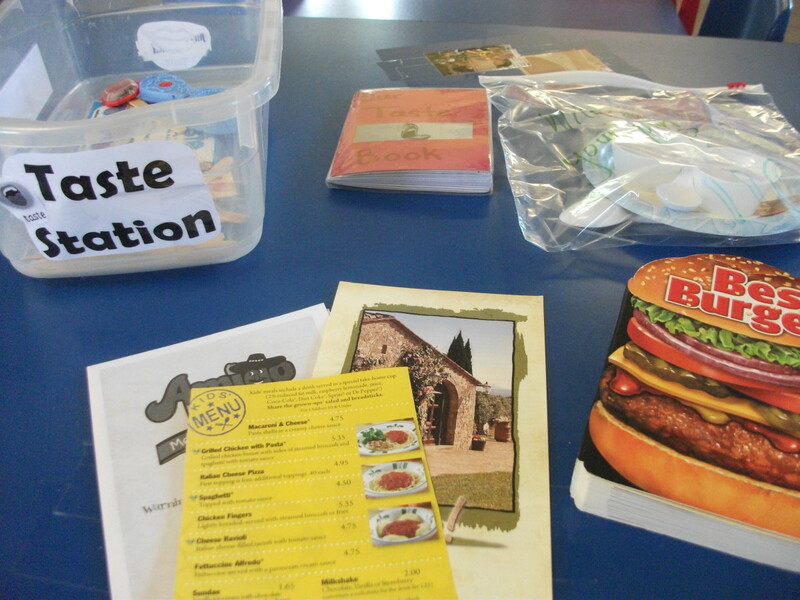 It is also good to serve food from other cultures so the kids can learn about what people from around the world eat. Let the kids use chopsticks to try to eat their food. You can also have a blindfold taste test. 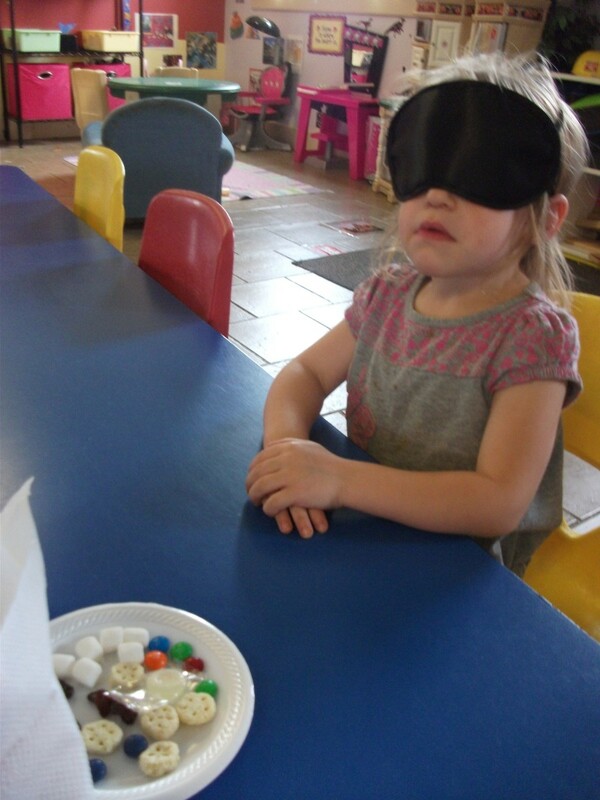 Put a blindfold on the kids and have them describe what they are tasting. Let them guess what the food is. Make a taste test chart. There are several different things that could be charted. Favorite foods, grossest foods, salty foods versus sweet foods, sour vs. bitter, good food versus bad food, and class food polls are good things to chart. You can compare the tastes of the kids. Find out who likes what. Jelly beans are great to use for taste tests because there are so many different flavors. There are even weird and gross flavored jelly beans. Nursery rhymes also offer inspiration for food. Read “Humpty Dumpty” and serve hard boiled eggs, “Do You Know the Muffin Man” and eat muffins, “Peter, Peter Pumpkin Eater” and try pumpkin pie, “Pat a Cake” and bake a cake, or “Goldilocks and the Three Bears” and make porridge. You can mix two or three kinds of cereal and have the kids sort them and snack as they work. Dining in the dark is a cool trend right now. Host a blind dinner at home with these ideas. It is great for romantic dates, fun for the family, or perfect for a party. Plan your own sensory event and create a unique meal that is sure to be a big hit. Let the kids cook something simple. Have them bake cookies or cook Jell-O or toss a salad. They will appreciate the food much more if they have a hand in preparing it. A trip to a farm or dairy is a good way to show the kids where the food comes from. Many children in these modern times don’t realize that food doesn’t just magically appear in the grocery store. Let the kids see step by step how the food gets to them. Grow a garden of your own. Let the kids plant seeds and take care of the plants until it can be eaten. Serve grapes and raisins or baked potatoes, fries, and mashed potatoes or boiled eggs, scrambled eggs, and poached eggs while the kids are blindfolded. Ask them if they know that each of the things they ate were actually the same thing. The way food is prepared makes it taste different. There are several ways to trick the sense of taste. One way is to hold or plug your nose and sample food. Have the kids describe what it tastes like. Then unplug the nose and try the food. It will taste differently than it did before. If food has a different color than normal, the brain will get mixed signals from the mouth and the eyes. The food will seem to taste different. Try serving green eggs or blue mac and cheese. Put food coloring in a bowl of cereal. Ask the kids if the food tastes different. Food coloring doesn’t have a flavor, so the change in taste is really just in their heads. Some kids will also be tricked with colored ice. Simply put food coloring into water and then pour it into ice trays. Serve the kids a piece of ice. Ask them what they taste. Many of them will think they are eating a popsicle or flavored ice just because the color is different. It should taste like normal ice. This works best on younger kids. Smell and taste are very closely related. Serve a child a piece of apple and ask them how it tastes. Now hold a cotton ball soaked in vanilla flavoring near his or her head and serve another piece of apple. This time the apple will have a vanilla taste. Will other flavors on the cotton ball have a similar effect? Cut out pictures of food from magazines. Let the kids glue the pictures onto paper plates to create their own tasty meal art. Have them color a picture of their favorite food or the grossest food they can think imagine. Make a collage using cereal pieces or pasta. Colored pasta makes for a nice collage. Spell words using food. Pretzel sticks are good for straight letters. Cheerios can make circle letters. Use raisins for other letters. String necklaces to nibble with round pieces of cereal. Peanut butter playdough is a great art activity for the sense of taste. Just mix 1 cup of peanut butter, 2 tablespoons of honey, and about a cup of powdered milk. Add powdered milk until the peanut butter is dry enough that it won’t stick to the hands. Let the kids make creations with the peanut butter. Raisins or pieces of candy work for eyes. When their creations are finished, they can be eaten if desired. There are many songs about food. Many nursery rhymes are about food as well. Here are a few taste songs. Explore the sense of taste with great things about food and taste. When we think of touch, we think of our hands. But actually all of our skin is sensitive to touch. So the organ we use for touch is actually the largest of the five senses. Nerve endings in the bottom layer of the skin receive messages when the skin comes into contact with something. These nerves also sense pain and temperature. The nerves then send the message onto the brain. Touch is a way that our bodies gather information about the world around us. If we couldn’t feel, we wouldn’t have the information we need to keep us safe. If you had no sense of touch, you wouldn’t know if something you were touching was hurting you. Pain is a warning that something is wrong. You could end up with a burn if you were near a hot stove and couldn’t feel that it was hot. Imagine not being able to feel when someone hugs you or to pet an animal and not feel its soft fur. Life would lose some of its pleasure. Simulating being without the sense of touch is next to impossible. Try letting the kids wear rubber gloves while playing in the sand. Ask them which way is more fun, with or without gloves. Once the novelty of the gloves wears off, they will realize that it is better to be able feel the sand. Another way to demonstrate not being able to touch is to have the kids put their hand against someone else’s hand. With the hands palm to palm, the child takes his other hand and simultaneously rubs his own index finger and the other child’s index finger. This will cause a strange sensation. Egg carton filled with things to feel. Put together a texture crate for the kids to play with. Use an empty egg carton. Fill each of the holes with something interesting for the kids to feel and touch. 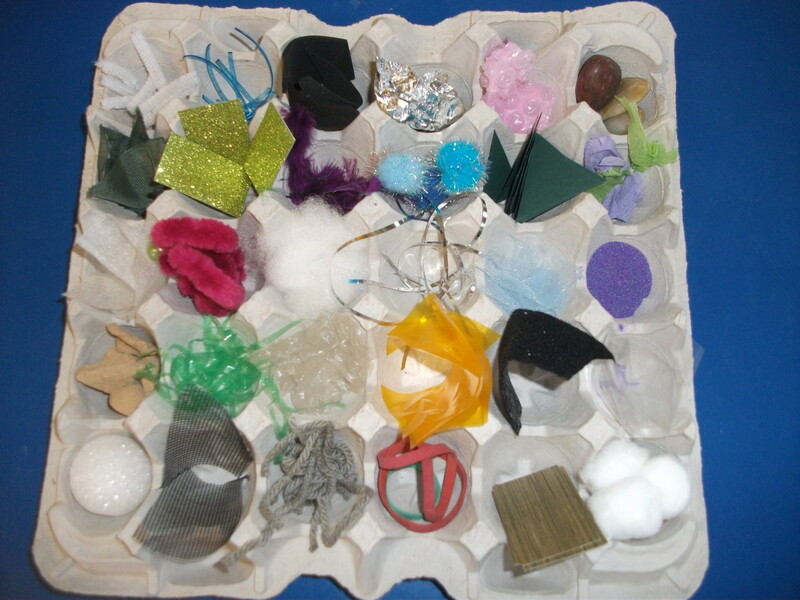 Cotton balls, Styrofoam, aluminum foil, rocks, craft grass, fuzzy pipe cleaners, and felt are some things to put in the carton. Try to find opposites such as something rough and something soft. Playing in sand in water is great for the sense of touch. You can hide items in the sand and have kids try to find them. You can also have the kids count the items in the sand using just their sense of feel. Uncooked rice, corn, and beans are another thing to use for texture. Let the kids play in these like they would with sand. Slime and goop are also fun to use for the sense of touch. You can even let the kids make their own slime. Put small items in the slime for the kids to feel and explore. Tiny balls, plastic letters, or animals can be played with in the slime. The kids feel the objects in the bag without looking. Make a feely bag. Find or make a bag that can close fully. A paper bag will be fine. Place several objects inside the bag. The objects should be things that can be identified by touch. There are a few different ways to play with the feely bag. You can have the kids reach into the bag without looking and guess what they feel. 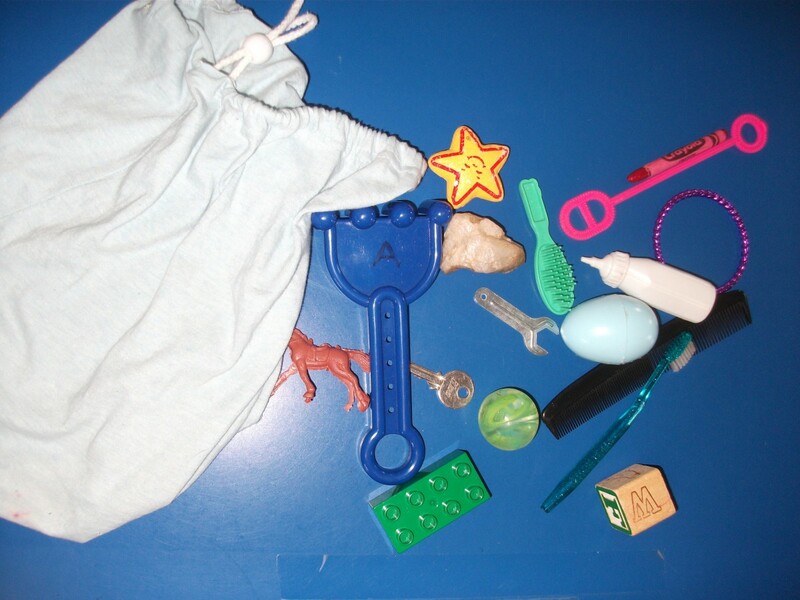 You can also name one of the objects that is in the bag and have the kids find it using just their sense of touch. You can also make pictures of the objects. Show the pictures to the kids and the kids try to find the object in the bag by feeling. You can also make a feely box so that the kids can feel what is inside. Cut a hole in a shoebox. Put something that feels interesting inside the box. The kids put their hands in the hole to touch the object. Have the kids describe how it feels and guess what it is. Let the kids feel hot water (from the tap) and then room temperature water. Then let them feel ice water and the same room temperature water. Ask them why the room temperature water felt cooler the first time and then warmer the second time. Read the kids “Goldilocks and the Three Bears” and do the above water activity to demonstrate too hot, too cold, and just right. Then find a hard chair, a very fluffy pillow to place in a chair, and a normal chair. The kids will learn about soft and rough. Create a texture walk. Using pieces of sturdy paper, attach several different types of materials to the pieces of paper. Good materials to use are sandpaper, bubble wrap, moss, cotton, cellophane, carpet, and even tape. Let the kids take off their shoes and walk or crawl across the different textures. They will explore the sense of touch using their feet instead of their hands. For art, let the kids work with different types of materials. Let them make a sculpture using lots of different textures. First give them some modeling clay to mold. Then sit out various art supplies and let them stick the objects into the clay. Glue sand onto paper to make a textured picture. You can also write words using the sand. 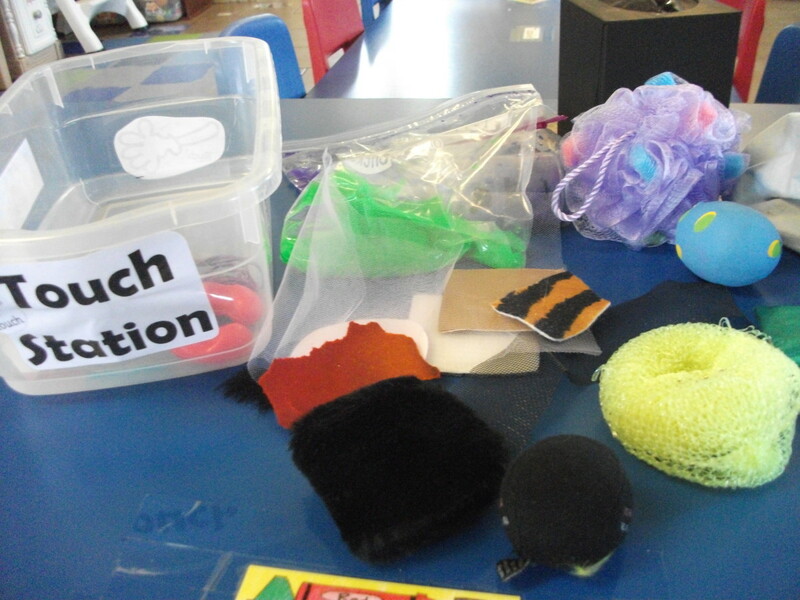 Make a “touch me” using various materials that can be felt. Have the kids paint with their fingers and toes. You can also do texturerubbings. Peel the paper off of crayons. Have the kids place objects underneath a piece of paper. Using the side of the crayon, rub across the object. A neat looking textured picture will soon appear. What kind of textured rubbings can you create? Does everything a texture that is visible when rubbed with a crayon? Songs about the hands and sense of touch. 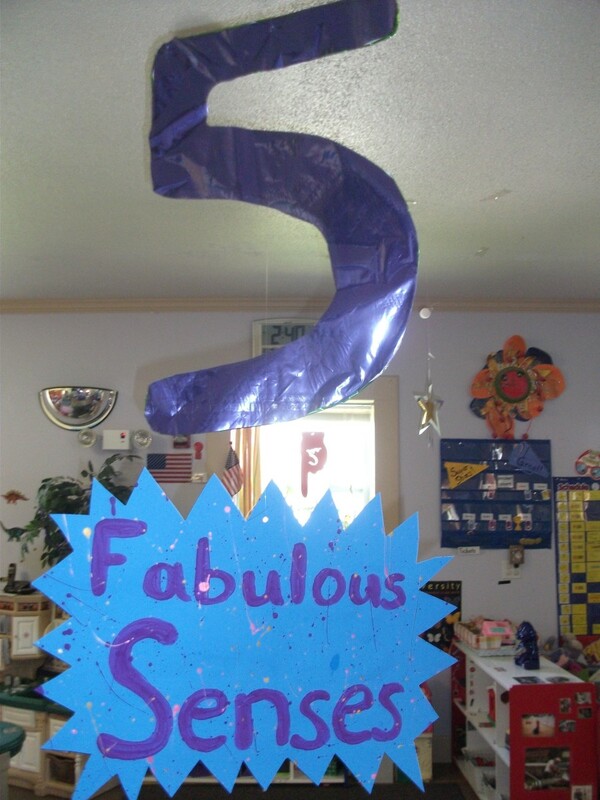 5 Senses Quiz: How much do you know? Which sense is taken the most for granted? Just a few minutes of blocking the nose should be fine for kids because they can still breathe through their mouths. But I wouldn't suggest doing it for long and maybe not with children with asthma or other breathing conditions. And it should definitely be a supervised activity. Thanks for pointing that out. You have worked hard and did research to write such detailed article. Thanks for a nice hub elaborating useful topic. Please refer to your one sentence. Can closing nose (Smell) not be dangerous for a kid? He might have problems in breathing. Nevertheless, Rated thiss up and beautiful. Lauren - That's sounds like a fun learning game! Thanks for sharing. I thought of a great game to play that makes kids rely more on their senses of smell,touch,taste,and hearing and less on sight. I tried it with my sister and we had lots of fun. First,blindfold your child and seat them at a table. Give her some food items to smell,touch and taste and see if she can guess what they are. Next,take her hand and bring her into another room and have her feel the different items and listen to different sounds.See if she can guess what room your in. Now you try. Put the blindfold on and have your kid take you to another room and try to guess which it is. Then talk to each other what they thought. If you both had fun,remember this game to play it again another day. What an amazing post! Thanks! It a cool ideas to let children know about their senses. It is amazing how much we learn with our senses that we aren't even aware of. 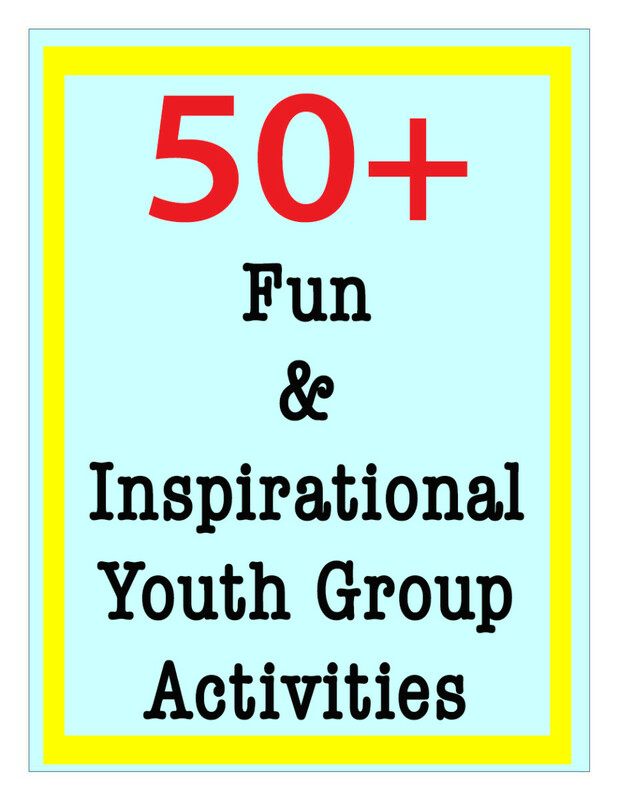 Plus kids love these activities. Thanks for commenting. Nice hub... I should try those for my daughter. I believe that this brilliant ideas will give the best result also. Brett.Tesol - Thanks! All children can benefit from understanding their senses better. Wow ... that really is quite a Hub! 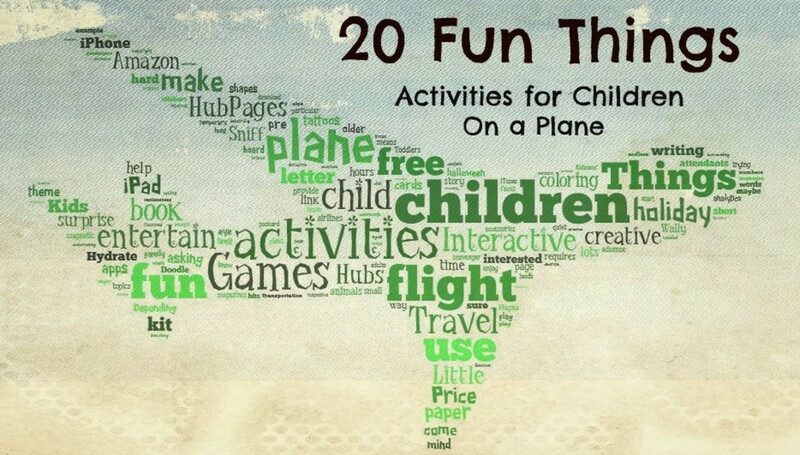 Some great ideas to help increase children's appreciation, empathy, understanding and awareness of the world and their senses (or possible lack of).